Bao Nguyen is the Mayor of the City of Garden Grove. He is also the first Vietnamese American Democratic mayor in the United States and the first directly elected openly gay mayor in Orange County. Prior to his election in 2014, he served, by appointment in 2011, then by election in 2012, as trustee of the Garden Grove Unified School District Board of Education, including a term as Vice-President. While earning his Bachelor of Arts degree in Political Science at the University of California, Irvine, Nguyen interned for the White House Initiative on Asian Americans and Pacific Islanders. Mayor Nguyen holds a Master’s Degree in Indo-Tibetan Buddhist Studies from Naropa University in Boulder, Colorado and a certification in mediation from the Dispute Resolution Program of the Orange County Human Relations Commission. Leah Lakshmi Piepzna-Samarasinha is a queer disabled femme writer, performance artist and educator of Burgher/Tamil Sri Lankan and Irish/Roma ascent. The author of the Lambda Award-winning Love Cake, Dirty River, Bodymap and Consensual Genocide and co-editor with Ching-In Chen and Jai Dulani of The Revolution Starts At Home: Confronting Intimate Violence in Activist Communities, her writings on femme of color and Sri Lankan identities, survivorhood, and healing, disability and transformative justice have appeared in the anthologies Octavia’s Brood, Dear Sister, Letters Lived, Undoing Border Imperialism, Stay Solid, Persistence: Still Butch and Femme, Yes Means Yes, Visible: A Femmethology, Homelands, Colonize This, We Don’t Need Another Wave, Bitchfest, Without a Net, Dangerous Families, Brazen Femme, Femme and A Girl’s Guide to Taking Over The World. She is the co-founder of Mangos With Chili, North America’s touring queer and trans people of color cabaret, a lead artist with the disability justice incubator Sins Invalid and co-founder of Toronto’s Asian Arts Freedom School. In 2010 she was named one of the Feminist Press’ 40 Feminists Under 40 Shaping the Future and she is a 2013 Autostraddle Hot 105 member. She lives between Toronto, unceded Three Fires Confederacy Territories and Seattle, unceded Duwamish territories. Kathy Jetnil-Kijiner is a Marshallese writer. Her writing highlights the traumas of colonialism, racism, forced migration, the legacy of American nuclear testing, and the impending threats of climate change. Bearing witness at the front lines of various activist movements inspires her work and has propelled her poetry onto international stages. She has performed her poetry in front of audiences ranging from elementary school students to most recently over a hundred world leaders at the United Nations Climate Summit, where she performed a poem to her daughter, “Dear Matafele Peinam”. Currently she lives and works in the Marshall Islands, where she teaches Pacific Studies courses at the College of the Marshall Islands. 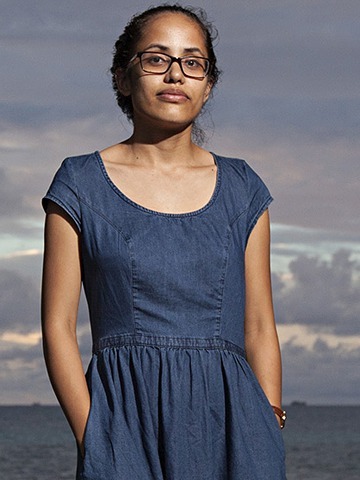 She is also Co-Director of the youth environmentalist non-profit Jo-Jikum, which empowers youth to work towards solutions on environmental issues threatening their home island.